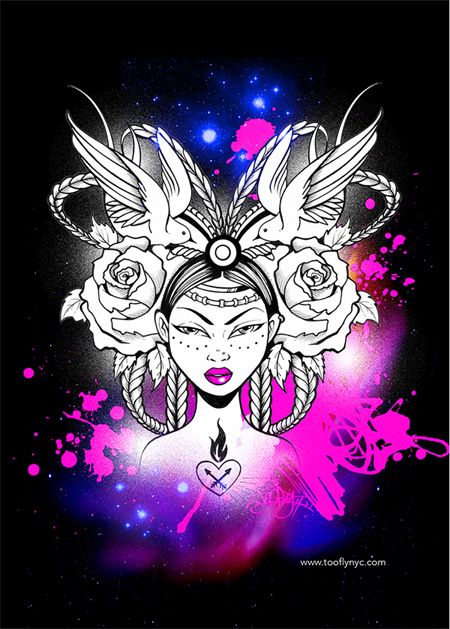 New York City, New York — World renowned street artist, designer, and social entrepreneur, Maria “TOOFLY” Castillo brings together the complete “LOVE WARRIOR” ART PRINT series to New York City’s My Plastic Heart Gallery on Friday, June 24th, 2016. An anticipated exhibition in the heart of downtown’s Lower East Side. Held from 6PM to 10PM, arts enthusiasts, tastemakers, press and friends will get to view the series that inspired a completely new direction for TOOFLY. Admiring a palpable presence of feminine power immersed in the rising spiritual.